French communal worker and writer; born at Hagenau, Alsace, Oct. 24, 1841. After he had graduated from college, the impairment of his voice compelled him to give up his plan of preparing himself for a rabbinical career, and he found employment in a commercial house. Owing to his unpleasant recollections of the manner in which the funerals of his parents had been conducted by the old ḥebra ḳaddisha, Scheid in 1863 established the Ḥebra 'Am Segullah, of which he was the first secretary, and later became president. This institution was founded on principles more in accord with the requirements of the time; and it was imitated by all the other Jewish societies of the kind in Alsace. In 1870, during the Franco-Prussian war, Scheid for the first time entered public life. After the battle of Frösch weiler he served as secretary to the committee which had charge of the wounded and of furnishing supplies for the invading army. When the war was over he was elected member of the city board of Hagenau, and became its secretary, as well as administrator of the public savings-bank and president of the Jewish congregation. 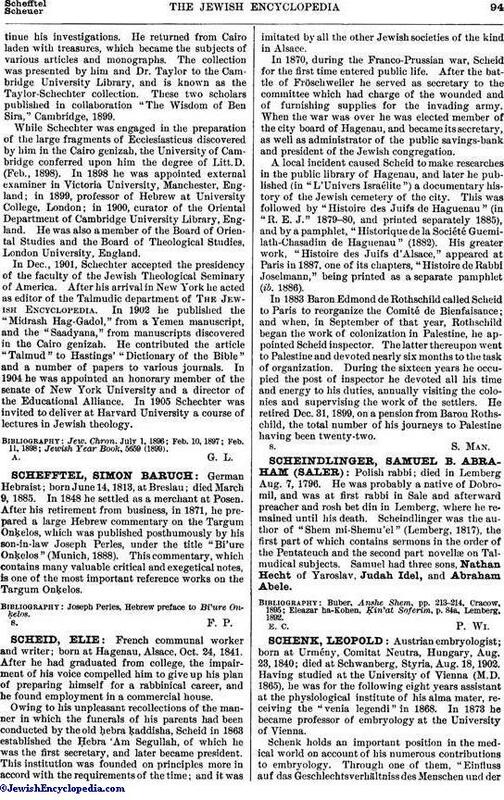 A local incident caused Scheid to make researches in the public library of Hagenau, and later he published (in "L'Univers Israélite") a documentary history of the Jewish cemetery of the city. This was followed by "Histoire des Juifs de Haguenau" (in "R. E. J." 1879-80, and printed separately 1885), and by a pamphlet, "Historique de la Société Guemilath-Chasadim de Haguenau" (1882). His greater work, "Histoire des Juifs d'Alsace," appeared at Paris in 1887, one of its chapters, "Histoire de Rabbi Joselmann," being printed as a separate pamphlet (ib. 1886). In 1883 Baron Edmond de Rothschild called Scheid to Paris to reorganize the Comité de Bienfaisance; and when, in September of that year, Rothschild began the work of colonization in Palestine, he appointed Scheid inspector. The latter thereupon went to Palestine and devoted nearly six months to the task of organization. During the sixteen years he occupied the post of inspector he devoted all his time and energy to his duties, annually visiting the colonies and supervising the work of the settlers. He retired Dec. 31, 1899, on a pension from Baron Rothschild, the total number of his journeys to Palestine having been twenty-two.